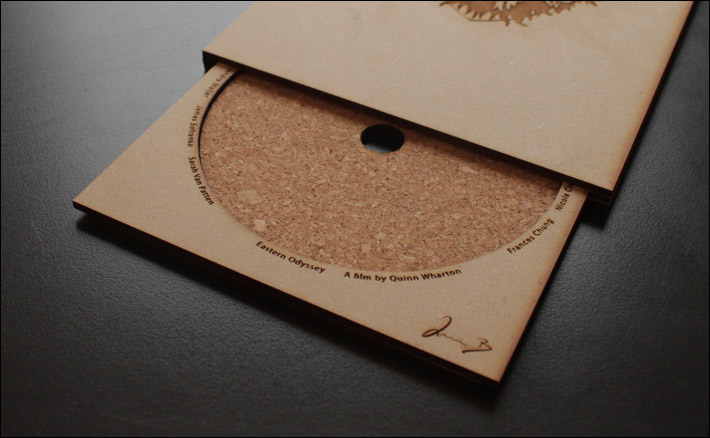 I designed this custom DVD case for dancer, photographer, and filmmaker Quinn Wharton’s 2012 documentary Eastern Odyssey. 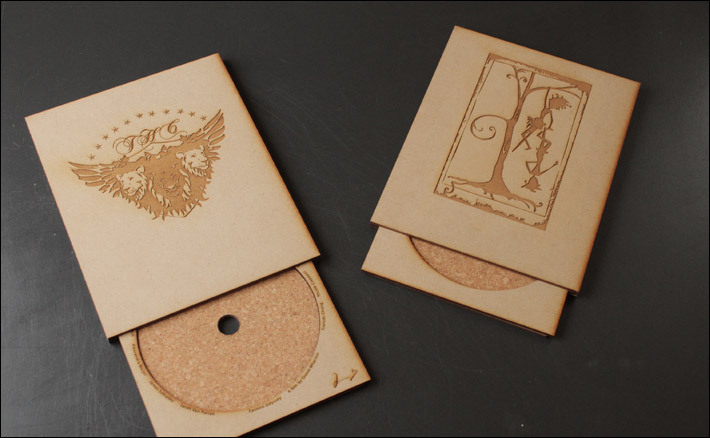 The film follows the Tiit Helimets Company on its dance tour of Estonia in 2010 and I was originally inspired to create this case by the company’s magnificent logo (a creation of Quinn’s sister, Autumn). It’s laser cut and hand assembled. 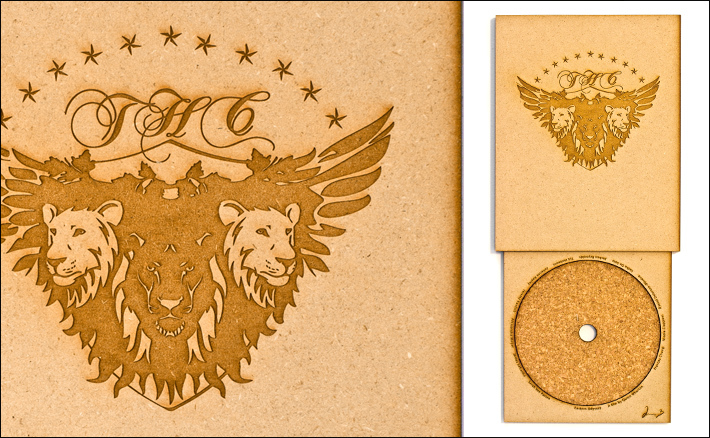 I created the first prototype in masonite with the intention of moving to an exotic wood when the design was finalized. From the first results, the client and I both felt the inexpensive masonite has a great industrial quality that works well with the logo and overall design; the material selection never changed. Quinn found the slipcover design was quite satisfactory and approved the first prototype. But I felt there was still more that could be achieved and pressed on with further iterations, deciding a complete case was the right direction to take this. The standard clamshell felt a bit pedestrian; a sliding tray is both consistent with the original slipcover concept and evokes the quality of mechanism. The second iteration full replaces the plastic case with a laser cut trey. An invisible catch at the top of the trey prevents it from sliding out completely. This version still retains the tab cutout at the bottom. 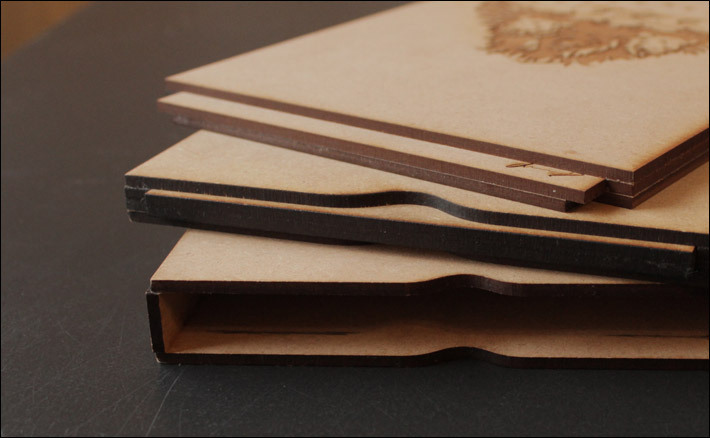 The final version integrates the trey with the back cover, reducing the weight and thickness of the box by a quarter. It also allows for the elimination of the pull tab and a cleaner design. 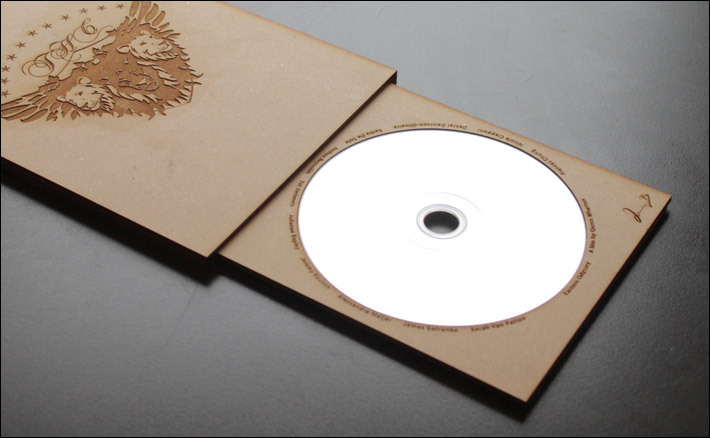 I created several iterations of this design including a slight flare at the bottom of the tray, and various profiles for the back cover. The final version is the most minimal, putting the logo in the spotlight. Additional touches include inscribing Quinn’s signature in the corner of the tray and the title and cast around the perimeter of the cork lined platten. After testing the case with another friend’s logo (The Paper Doll Militia is a fantastic aerial circus), I’ve decided to make the file freely available for personal use as it is well suited to small film and music projects.